ATP Tennis Travels: 3 Important tips for Watching the US Open Live! Want to see the top tennis players in the world? This is the 50th US Open! Federer and Nadal will be in NYC at the biggest Tennis Stadium in the World! If you're a real tennis fan in the USA, you gotta go see the US Open at least ONCE in your lifetime! NYC Summer fun! It's your chance to catch a glimpse of the Grand Slam winners Roger Federer and Rafael Nadal! Subscribe to get all my tips sent to your email (in bite-size nuggets of wisdom). So you can read it over later and take with you to the US Open! Free US Open Ticket Discounts and Tips. I have personally attended over a decade's worth of Grand Slam tennis (all four). Been to NYC dozens of times in my life, with family and friends to see the best matches. The sport has given me an insider's view at all the Tennis Majors as a tennis fan, player, coach, and now as a sports media photographer and journalist. Now it's your turn to go without breaking the bank! Get 2-for-1 tickets from Ticket Bargains. I want to share my experiences and tips with others to get the best experience possible for new fans. Because I get asked in person all the time, it was just easier to write it down. As a USPTA Professional - I'm committed to making the US Open Experience fun, affordable for ALL Americans. While coporate greed is causing ticket prices to skyrocket, I want to make sure the true fans have a better chance at watching these "Sold Out" matches in real life. Tickets are still being bought and sold by fans, look here in July-August. Even these so-called "sold out" sessions will still have ones available! The Labor Day Holiday Weekend Tickets get sold more quickly. Prices and new tickets are updated daily, so it helps to bookmark and check back! Our Facebook Updates keep you in the loop about upcoming schedule and player changes. Read my email tips before you buy tickets! Free US Open Advice from 10+ years of tennis. First thing is to buy tickets - without these, you can't go in. Figure out when you want to go and look up ALL of that day's prices. Ticket Exchange usually gives you the biggest listing so I check there first. If this is your first time, and you want to just experience some tennis - try to go during the first week. 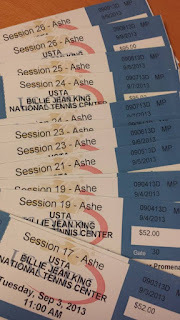 Here is a great tennis ticket tips site with lots of US Open promo codes. 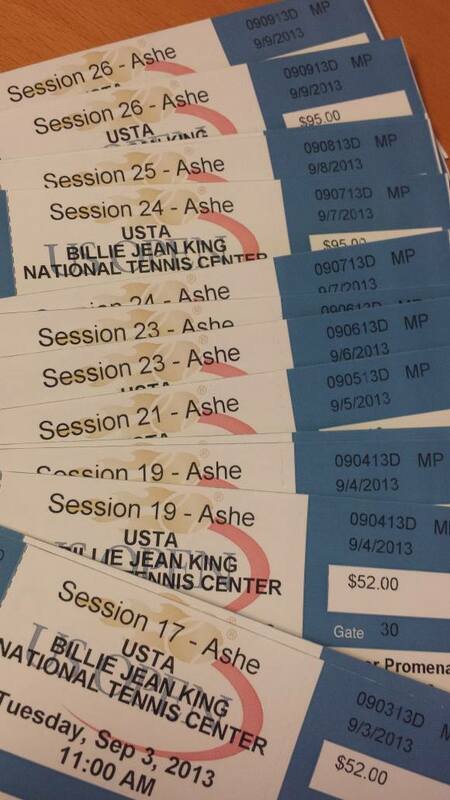 1) TicketMaster owns all original US Open Tickets. My best advice is usually to wait until July-August to look for the best deals. For example on 8/3/10, they released an annual code "WFANDANGO" in the morning which has seats available for $12 for both the 1st week and the 2nd week. These codes were last available back in 2011, but google "Tennis Bargains" to get other US Open promo code pages. There are also 2-for-1 (buy one get one free) tickets that are around $25-$35 each that are for the Upper and Lower Promenade, which is a bit closer. Remember: You can always sell your extra ticket here. The trick is to buy these cheap Arthur Ashe tickets, but DON'T sit in the nosebleeds section in Ashe! You'll have a better view of the NY city skyline than the ant-sized players a mile below you. But you see, unlike Grounds passes and Armstrong tickets that do not allow you into the main stadium court, with Ashe tickets you can go anywhere. Another great tip if you are buying last minute tickets, is to check the resell Ticketmaster exchange market. This is because Ticketmaster allows fans to "auction" their unused ticket if they cannot go or if they have an extra. They get money back if their ticket gets sold, and you can usually get a great deal from a season ticket holder who cannot attend all sessions. Sometimes even so-called "sold out sessions" can be bought here. You will know the tickets are legitimate because it is sold and controlled directly by Ticketmaster. Fans can even email their electronic tickets. So why is the Ashe ticket better than the rest? The Ashe Roof! Shade and no more rainouts! Reserved seats to go back to when you're tired from walking around the giant US Open grounds with its 34+ courts and practice areas. All other courts (other than Armstrong and new Grandstand stadium) have a smaller reserved seating area but most of the seats use a "first-come, first-serve" system. This means if you get in line early (gates open at 11AM and the EAST gate is the least crowded out of all of them), anyone can literally run to the Grandstand court (3rd biggest stadium court) and get Front Row seats! If you're young and fast, this is great - if you don't want to have to mess with that then it's better to have a reserved seat you know you will have. If the Ashe ticket deals run out or get too expensive, then the 2nd best option is to invest in a Grounds Pass. Why? 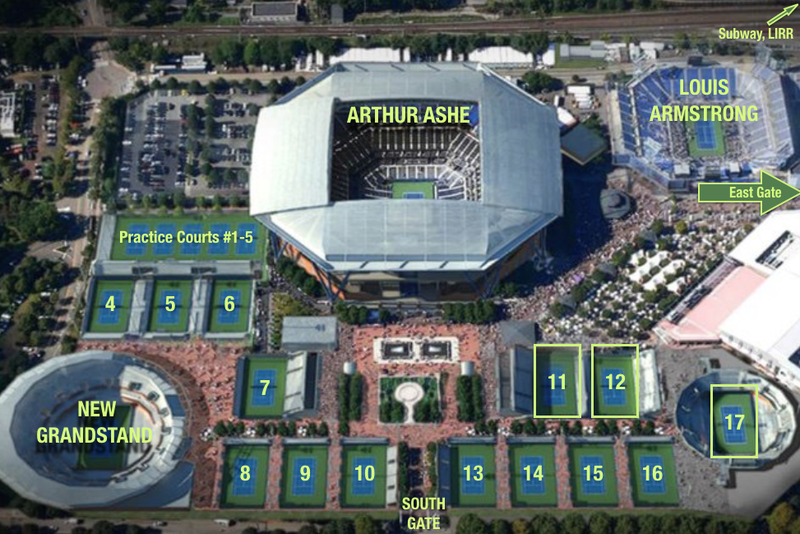 This lets you tour all the stadiums except on Ashe and usually a little bit less expensive. I did this myself a few years ago and got to see a couple grand slam winners play just a few feet in front of me. The grounds pass also encourages you to move around. If you stay in one spot all day at the Open, you are missing the point! Check out what else is going on. Be sure to use a tennis app that has updates to the scores (Official US Open App for Andriod). If you see a match headed for the 5th set, this might be a good one to head towards. If you know some very popular players you want to see are going to be going on a side court soon, then do yourself a favor and head there early 1 match before. That way you get a prime seat AND watch them warm up. This gives you the best opportunity to get some great close-up pictures as well! 2) Where should I go first when I get there? Scout out the "Schedule of Play" the day before. Knowing the first match on each court is essential. Find your favorite match and player(s) that will start at 11 AM, then bee-line to that court! Use the US Open map to help you find it in advance. To get close-up pictures and autographs, find out first which practice courts (labeled P1-P15) they are practicing on. When they are done with their practice session, they will usually come out one side and that's when you want to be at the front of the line. If you want a picture with your tennis hero, have a buddy stand with the camera ready to take a snapshot! If you want an Autograph Signature of your favorite star, be sure to have a pen and the item ready which you want to be signed. Remember though, Timing is everything, if you're slow or fumbling for a pen or camera, they will usually go to the next person, or worse start walking to the locker room! Buy a Blue Fine-tip/broad-tip double headed Sharpie (black will usually fade/smudge into a green color over time). Use the fine tip on posters and tennis trading cards (these are awesome and for sale by Ace and several other companies). I recommend getting a little business card holder and putting in the players' cards you want an autograph and you know will be in that tournament. At the local DC tournament Legg Mason, I happen to have been in the right place and the right time for a picture with him. Go to Wikipedia and search for "Tim Henman" - his main profile picture/mugshot was shot from my camera that someone (I do not know personally) cropped and uploaded there. I was able to get Tim Henman to sign his player card. He is retired now but was the former #1 British player in the world. This can be worth a small fortune in the UK if you find the right fan. This is very important and some would say is even more interesting than the actual match because you get to see them hit many more ground strokes, serves, volleys, plus *trick shots* that they will never try in an actual match. Sometimes if they are in a good mood, they will even chat with the fans and give you a souvenir. Also for one, sitting right up close to the "50-yard line" for a sport such as American Football might be great, but in tennis that might mean that your head will swivel left and right the whole match if you're trying to watch the ball*! Plus you do not want to be blocked by the umpire's chair. This is only a major factor if you are in the rows up front (up to about 5 rows back). How do I see Federer, Nadal, or any one of the Top 3 men's players in the world...? Usually when Federer or Nadal practice, you will see the mobs of people following them. I would avoid getting stuck behind these people. They also have a small army of USTA bodyguards around them so don't try anything silly, or wait in the long queues for an hour and hope that you get 1-2 pictures of him before he disappears. Here is the best trick to see the big stars from up close...They will almost always be practicing on P1-P5, which is just to the side of the main stadium. Here is a map that shows you this exact location on the left side. There are also very accessible bleacher seats beside each court, and also has a view of match courts 4-6 on the other side. Underneath the stands is a walkway that allows fans to watch from court level behind the players. It is also equipped with a few TV's and score updates from other courts. A great place to spend some time out of the sun. Shhhhhh....But you must be very, very quiet and not disturb the players or the patrolling groundskeepers will have you removed very quickly! To get an idea of how *close* you can get - go to Flickr and search " tennis8 nadal". When he comes to pick up a tennis ball, he is literally inches from you and you can take pictures to your heart's content (without Flash of course!). He looks skinnier in person, in my opinion. If you are on a strict budget, how do you see your favorite player? If you plan to bring young children (ages 6-12), I would recommend that you go during the opening weekend. This Saturday and Sunday is usually not very crowded and is very family/kid friendly too. Almost all the Pros will come out to practice/play and it is completely FREE to the public. To see what this looks like, see my pictures of the event. The best time to go see a lot of tennis matches and players (most of whom will not have been eliminated in an upset) is the first week or even the days just before Arthur Ashe day and qualifying matches are being played (best out of 3 sets). 3) Where is the best section to watch the best tennis? This is a very important choice that will affect your experience for the next 3,4, or even 5+ hours if you stay to watch the entire match there (remember grand slams are best of 5 sets). Be comfortable. Part of this depends on those sitting around you. Trying to crane your neck all the time to see over someone in front of you is not worth it. Just find another seat if possible. Also, please be considerate of others trying to watch around you as well! If you are on any other court but Ashe (although up at the Promenade top level, most people do not care) it is generally 1st come, 1st serve to seat. Therefore if you see a lot of open seat choices, you want to consider the following. Avoid Looking Directly into the Sun! It goes without saying, but if you get a lot of glare and heat on your face then it will be hard to enjoy the action. Ideally, the sun is to your back or at least to your side. What is the highlight shot you wish to see most? From years of photographing and watching tennis, you learn to scout a location first before planting yourself down. If the player you wish to watch is right-handed and has an amazing forehand - then the best angle to watch this shot would be somewhere between the service line and the baseline on the same side as the forehand. Note the if he/she is left-handed OR the backhand is the better shot, then you want to be on the other side. Are you viewing it as a tennis player (trying to appreciate the topspin, the speed of rallies and tactics used in the point)? If so, try to get a seat near the baseline. This gives you almost a first-person point-of-view of the rallies and also you are usually low enough to see the height they hit the ball, the amount of spin they use, etc. If you want to be close to the players' box (their coach, friends/family) etc, then sit near the corner. This is cool if you speak their language and can understand what type of commentary/analysis they are giving. It is also a more emotional section where the die-hard fans of a player will flock and cheer more loudly. If you want a view of your favorite player's facial expressions. If you will not mind moving your head side to side should you decide to follow a point, then up close to the 1st row Opposite side of the Umpire seat is the best photo angles usually. This is also usually where they will have the "camera pit" for journalists and magazine photographers with press passes. The night thing about this spot is that on every change of ends, you have a direct view of the players and also if your tendency is to just watch one player most of the time anyway, then you'll be either facing left or right for that game anyway. Be cool in the shade when temps are high. Easy Tip: Sitting on the side with the umpire chair (West) will generally put the sun to your back. When you enter into Ashe Stadium through the big main gates, you are facing North. When you look at the court the chair umpire seat on the left (West Side). In 2016, Ashe Stadium got a new roof! It now provides extra shade if you are up closer to the top. The view isn't great but at least you won't sweat bullets on the East side. No more rainouts and also some much-needed shade for fans to hide under on those hot summer days! In 2018, Armstrong will have a roof as well. If you go during the morning session, I recommend that you pick a seat with the sun to your back. In Ashe, that would be sections in the 320s to 340. This is important on hot NY afternoons because you don't want to be roasting (at least I know I don't). On Armstrong and the Grandstand, there is usually a few rows in the shade of the bigger stadium directly adjacent to it. 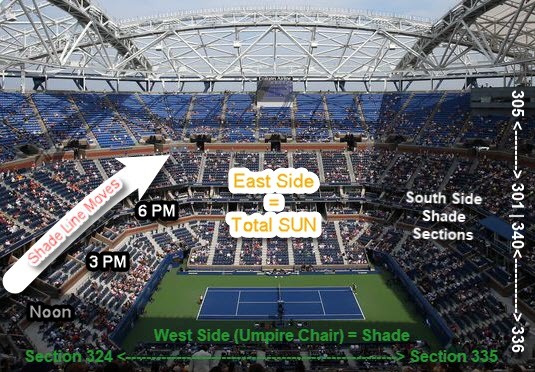 At night, the top few rows of Ashe can get pretty windy/cold, so pick your seat carefully. Sometimes if there are empty seats in front of you, the Usher will let you sit further down. D) Are there two matches on Ashe/Armstrong at the same time but can't decide between the two? If you can afford it (or find a good deal <$200) then opt for a Loge Level (balcony seat). Great view of the whole court and nobody's head in the way! Another option is to buy a Reserved Armstrong Ticket ~$150+ ticket on a popular day (Labor Day weekend) as you'll likely get to watch a couple seeded players. There you have it - so now go out there and enjoy the US Open! Check out my website (www.tennis-bargains.com) for other great money saving tips on Tennis and also the best deals and reviews on Tennis.